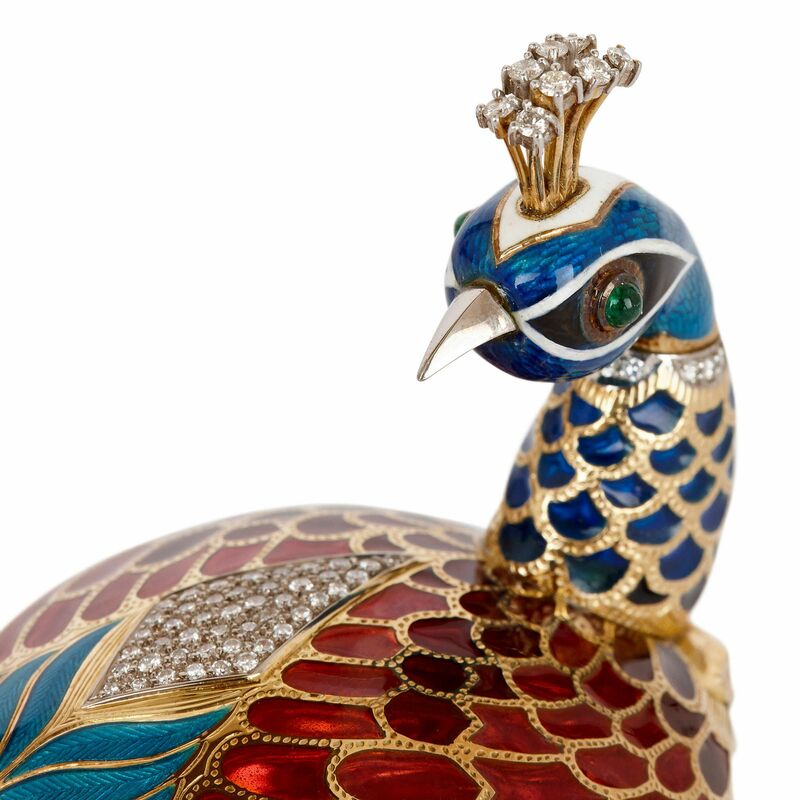 This 18 carat gold, exquisitely-decorated Asprey easter egg opens to reveal a small container, taking the form of a peacock with bejewelled feathers and emerald eyes. 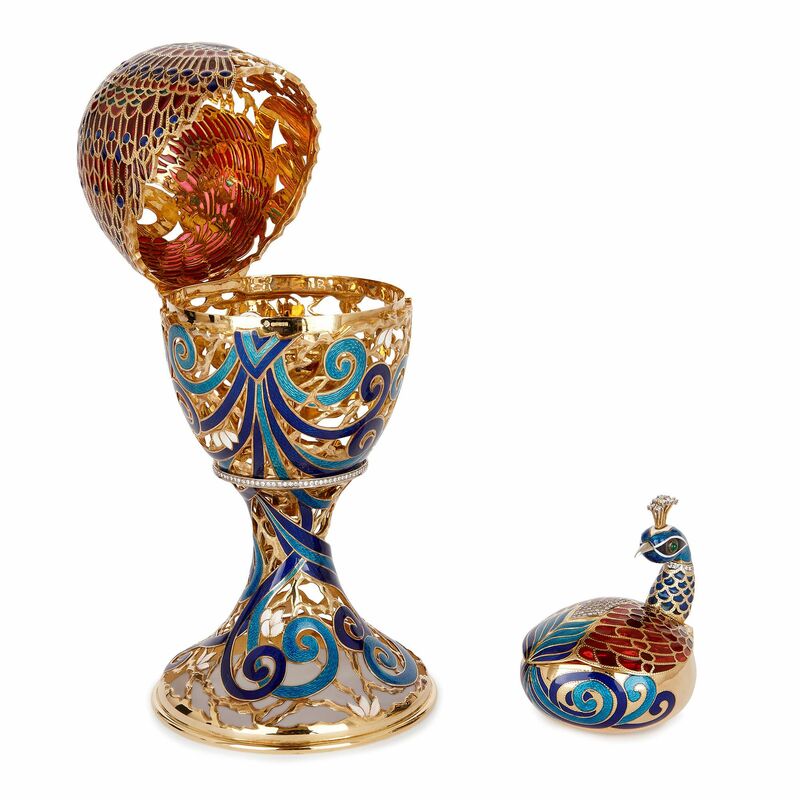 The gold container takes the form of an egg, which stands on a waisted stem and circular foot. 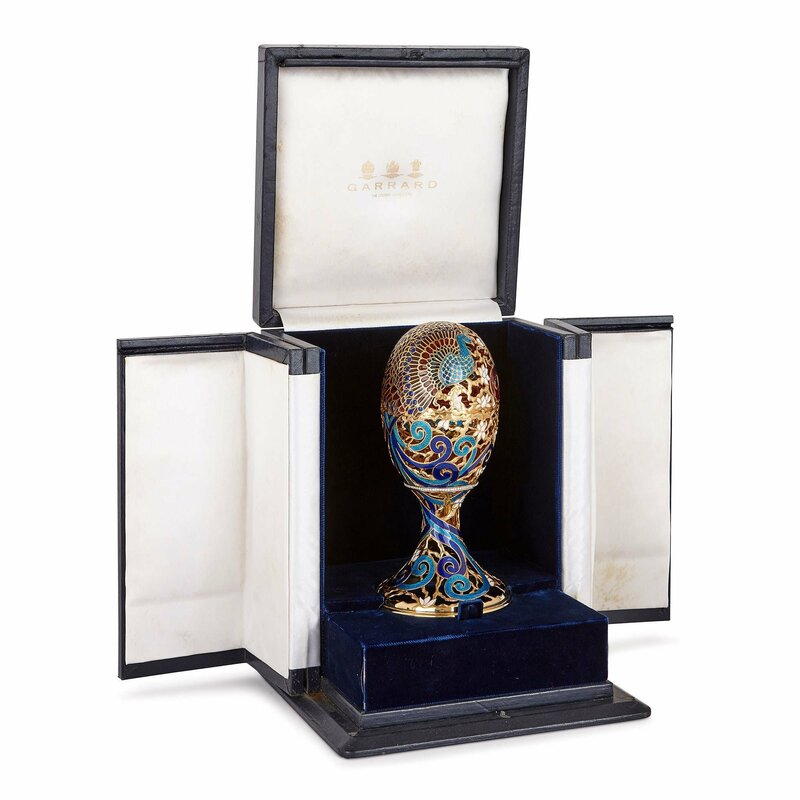 The egg has a fine, pierced gold frame, the cells of which are filled with colourful enamels. These form a peacock, with a magnificent fan-shaped train of feathers. 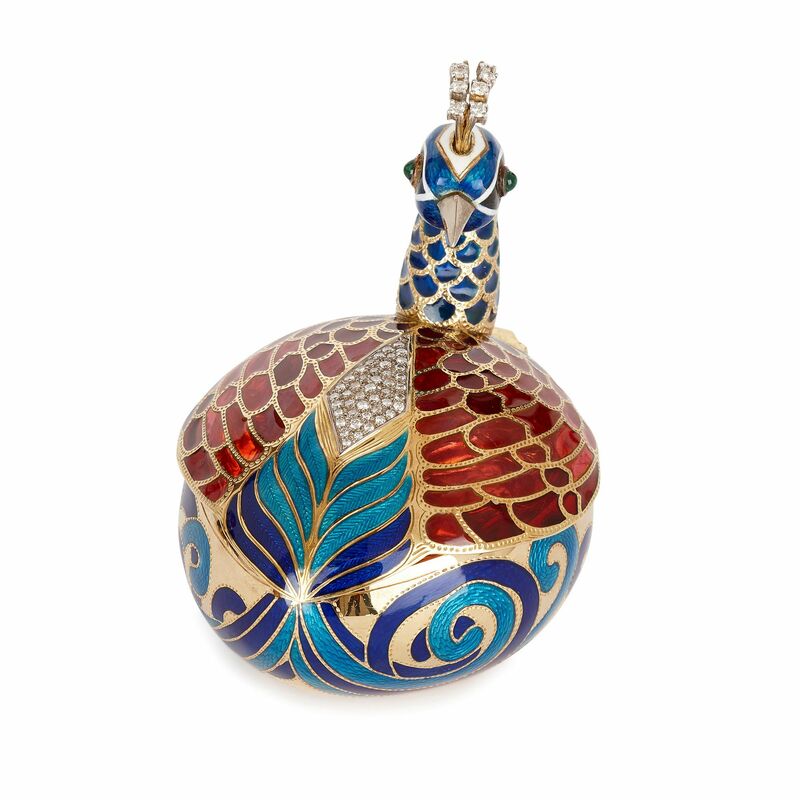 The peacock’s train is composed of beautifully-translucent green, red and navy plique-à-jour enamels. 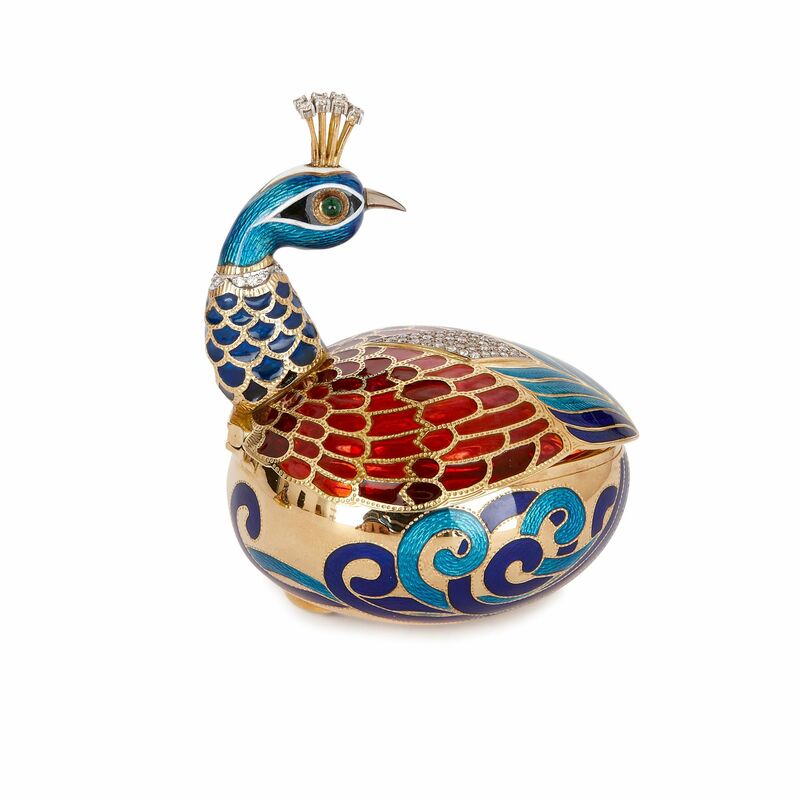 Its royal blue body and long, curling blue and navy tail feathers have been decorated with intricate, textured guilloché enamel. 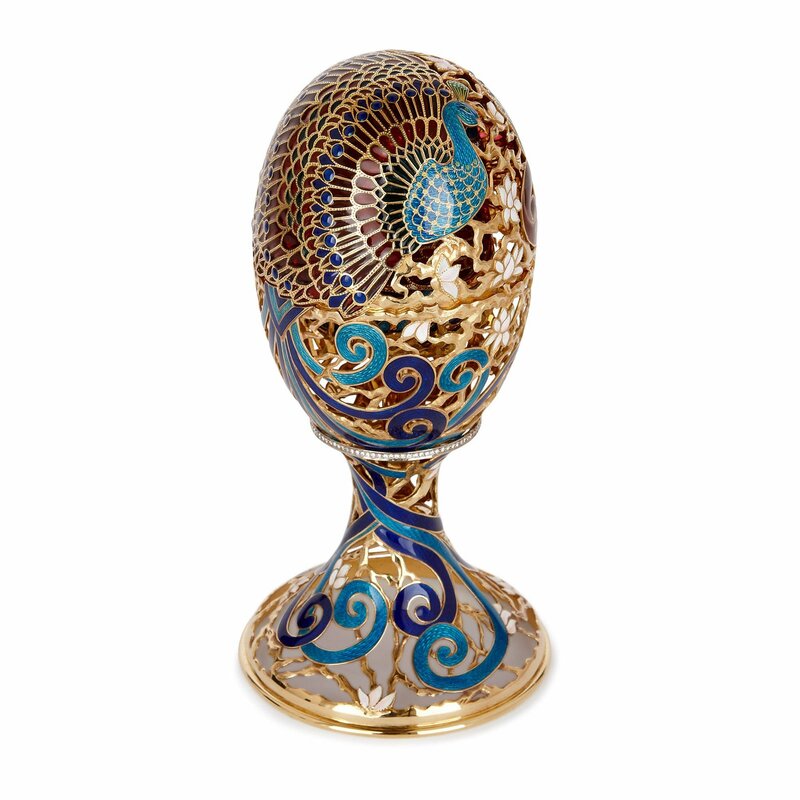 White enamel flowers decorate the body and foot of the egg, and the base of the egg body is encircled by a band of diamonds. 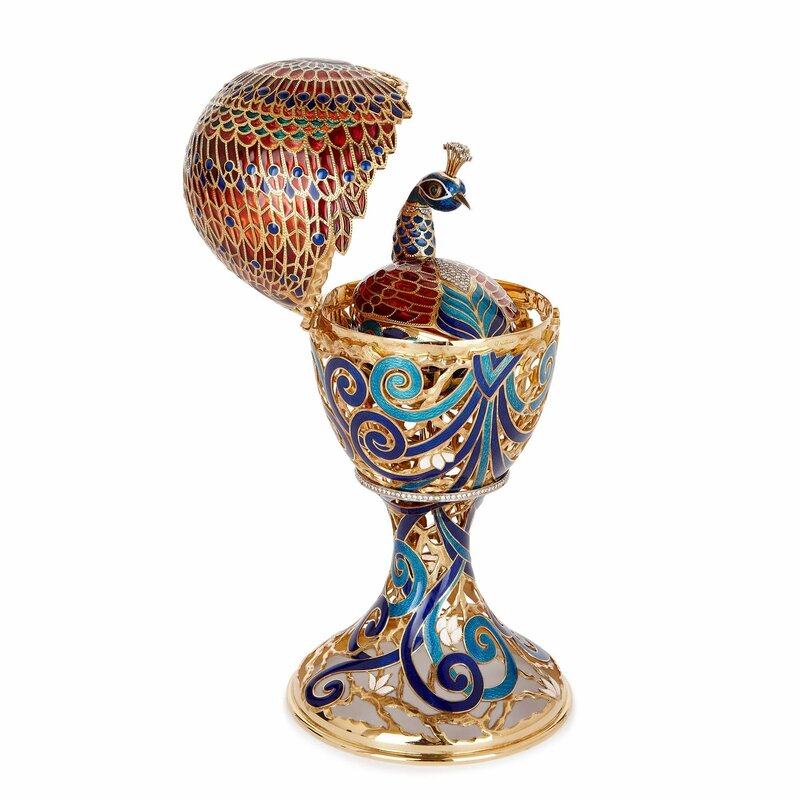 This egg opens to reveal a small gold container, shaped like a peacock. 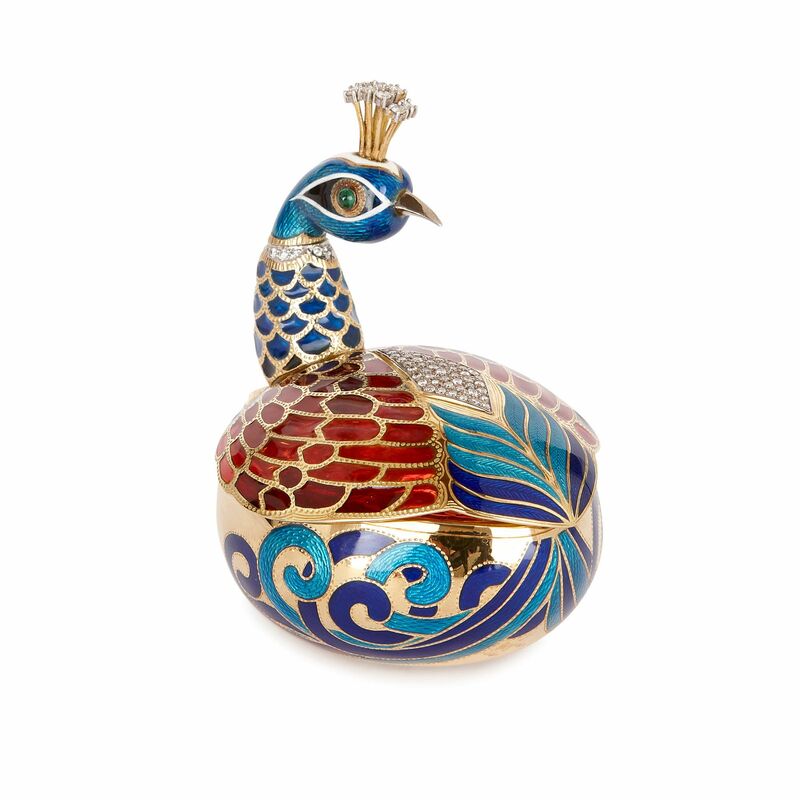 This peacock is similarly decorated with red, royal blue and navy plique-à-jour and guilloché enamels. Its crest, neck and back feathers are studded with diamonds, and its eyes are composed of green emeralds. 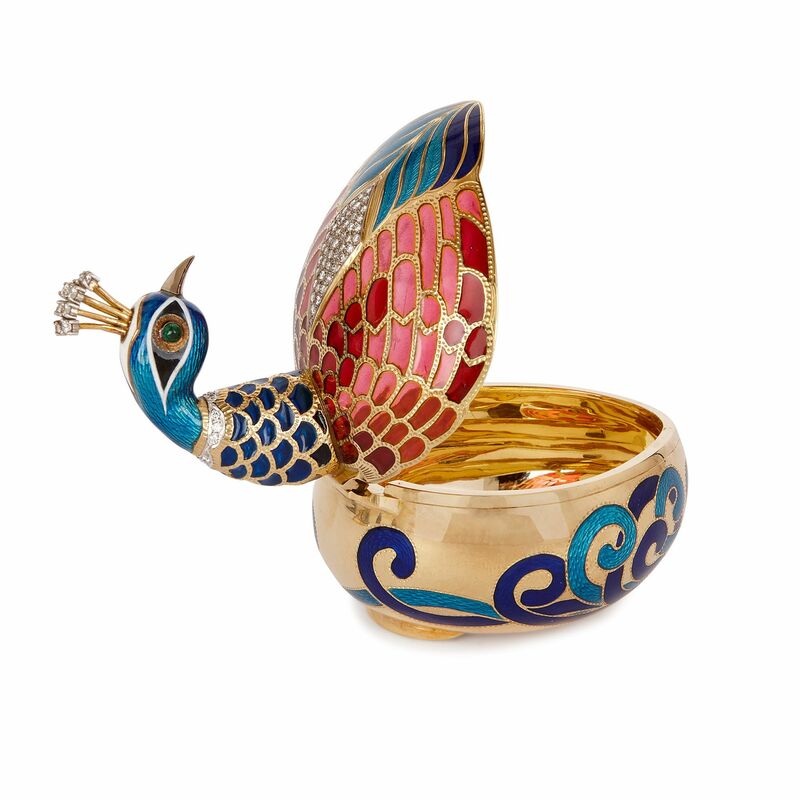 The peacock’s wings lift up, providing a hinged lid for a gold oval-shaped box. 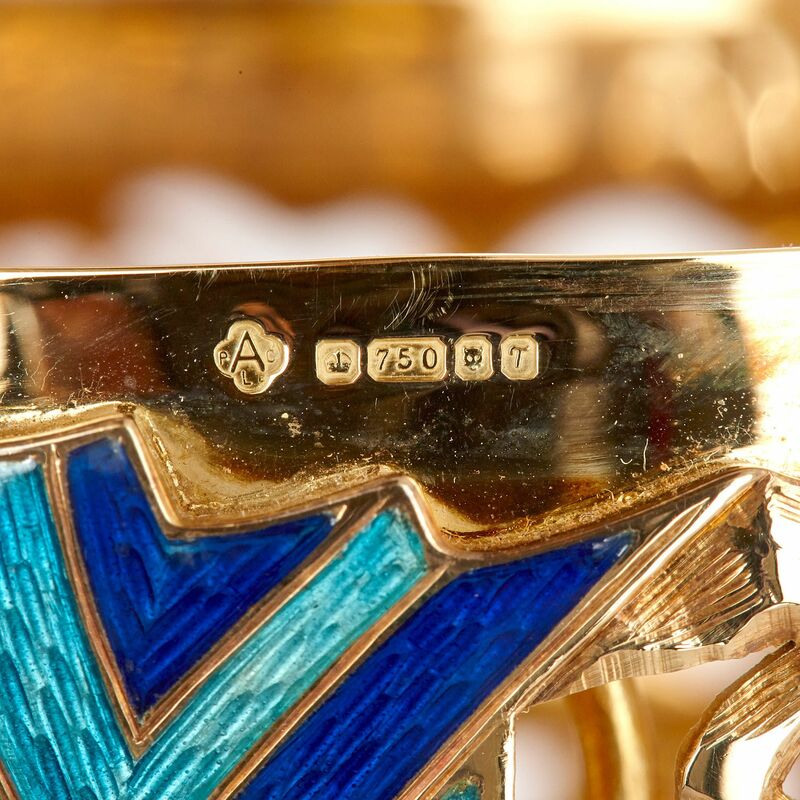 ‘A plc’, for Asprey & Co is stamped onto the two gold pieces, accompanied by full sets of hallmarks. The egg is then set in a fitted case, which features the retailer’s name, ‘Garrard/The Crown Jewellers’. 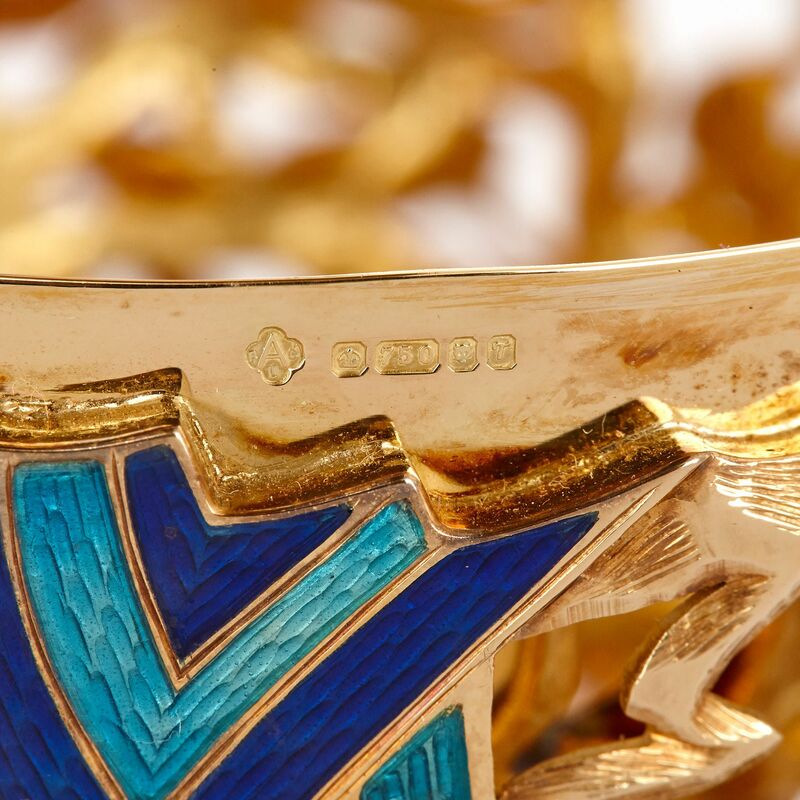 Asprey was founded in London in the late 18th Century, and has since become world-famous for its fine quality jewellery and other luxury items. 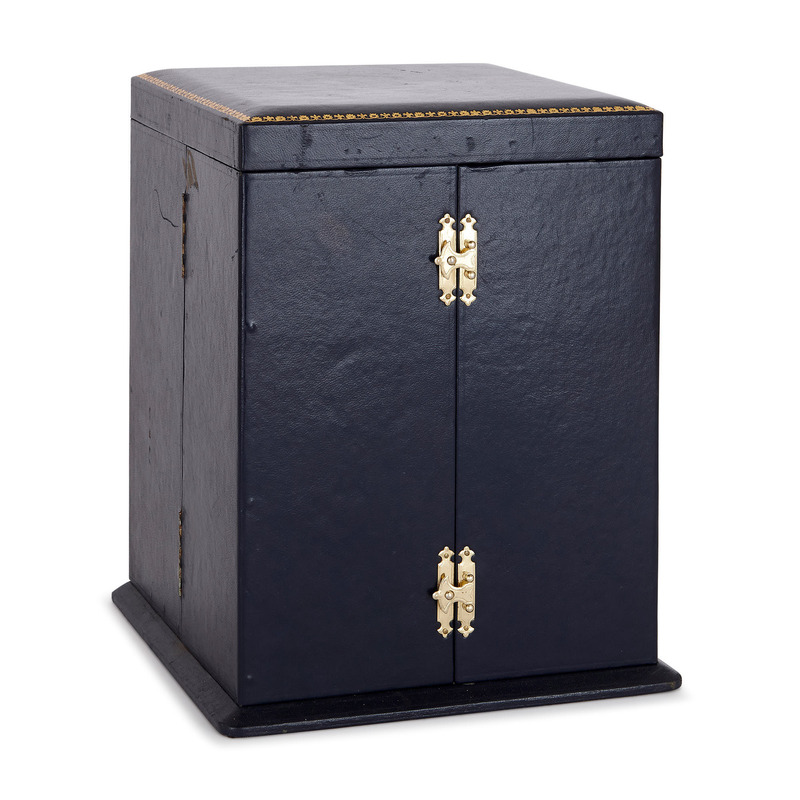 The company have supplied royalty, not only in Britain, but across the world, with crowns, coronets, sceptres and other such wares, for centuries. 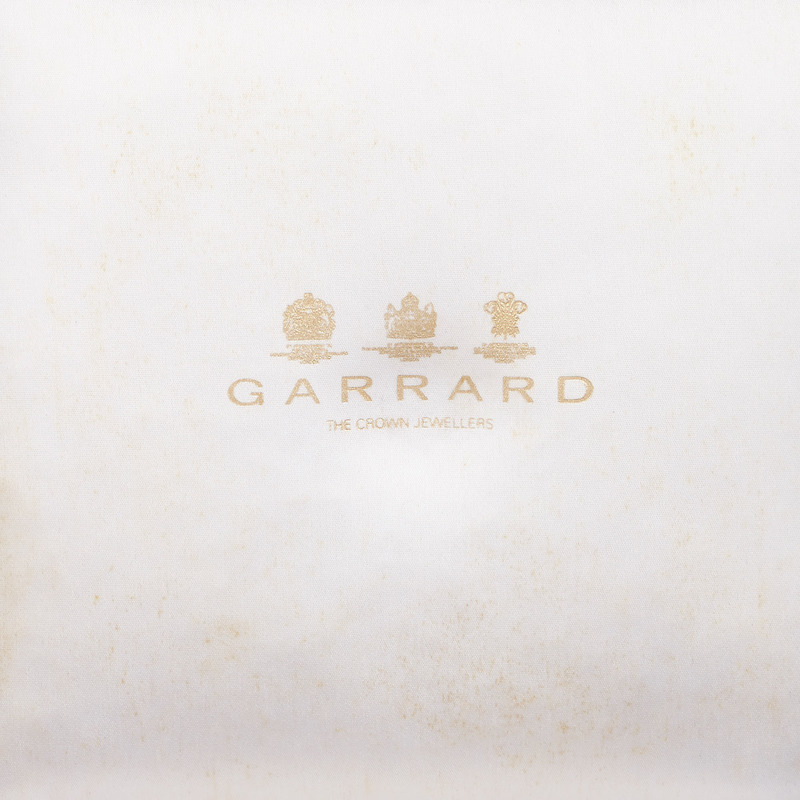 The retailers, Garrard & Co, were originally partners with Asprey, and similarly specialise in the production of luxury jewellery and silver for an important clientele.